Last week, I shared with you a study that explained how you can improve your skin's appearance by taking astaxanthin and collagen hydrolysate. You can find astaxanthin in Chlorella. But to get the collagen in your diet, the tastiest way is to spend a little time in the kitchen. Optional: 1 bunch of parsley, 1 tablespoon of sea salt, 1 teaspoon peppercorns, additional herbs or spices to taste. I add 2 cloves of garlic for the last 30 minutes of cooking. Put the bones in a large stock pot with one gallon of water and two tablespoons of apple cider vinegar. Let sit for 30 minutes. The vinegar helps to pull some of the minerals out of the bones. Roughly chop the onion, carrot, and celery and add to the pot along with the salt (optional), pepper, and any spices or herbs that you enjoy. Bring the liquid to a boil. Once it's boiling, reduce it to a simmer. 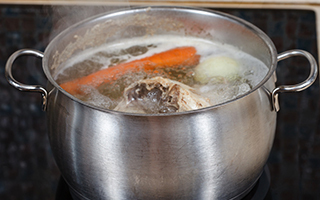 If you are making beef broth, simmer for 12-24 hours; chicken broth, 8-12 hours; or fish broth, 4 hours. Note that fish broth can be a bit smelly. After 2-3 hours you will notice foamy things floating on top of your soup. Just skim them off. When you're finished simmering, strain the broth. If you like, add new vegetables to have vegetable soup, or you can keep it vegetable free and use it as a broth in other recipes. When you refrigerate it, you will notice that it is quite gelatinous. The gelatin is your own homemade hydrolyzed protein. You'll enjoy the taste — and the benefits it brings to your skin, hair, nails, and bones.